MymT is a methallothionein binding Cu (II), it binds 4-6 Cu(II) ions. MymT can be used to accumulate Cu(II) intracellular. The gene was functionally expressed in E. coli, though it should be expressed at 15°C as it will be completely insoluble when overexpressed at 37°C. As MymT was shown by Gold et. al(1) to bind up to 7 copper ions (but with a preference for 4-6) we investigated whether MymT would be suitable for our project. We codon optimised this copy of MymT then added a C terminal his tag to create part: BBa_K1980002 and also produced a codon optimised form with a C terminal sfGFP that also had a C terminal His tag: (BBa_K1980003). In addition we expressed both from the copper sensitive promoter, pCopA, with the copper regulator expressed divergently from the pCopA promoter: (BBa_K1980011 and BBa_K1980012). We cloned our codon optimised, his tagged MymT from Gblock into the shipping vector then transferred it into the pBAD, arabinose-inducible commercial expression vector. We were unable however to detect copper chelation activity of MymT when expressed from pBAD in MG1655 E. coli strain, using a BCS absorbance assay. 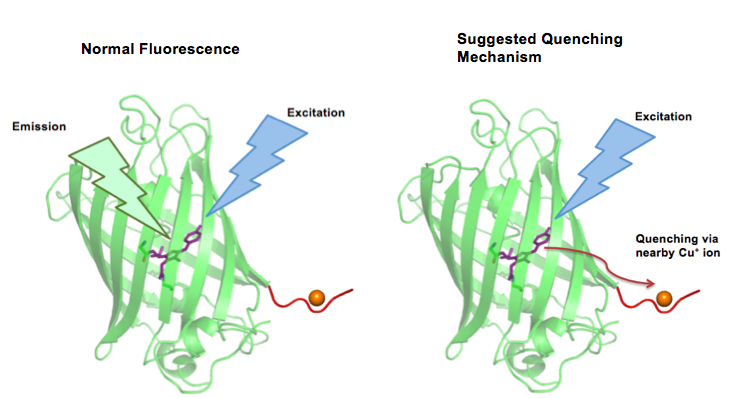 Modelling by our team suggested that this was because insufficient protein could be expressed to chelate the amount needed to be detectable on the assay ( 2μM detection limit). We purified the sfGFP-tagged version of this protein (BBa K1980003) but were still unable to detect copper chelation with the assay in our purified extracts. We sent Cardiff iGEM our parts MymTsfGFP in pBAD and pCopA CueR sfGFP (as a control) in live MG1655 E. coli in agar tubes. Cardiff grew them overnight in 5ml of LB with 5uM copper with and without 2mM arabinose.